We have completed our stay at Dharan and about to leave to go back to Kathmandhu. It would be an understatement to say that it was an interesting experience. We completed 30 major cases in 5 days. When I say major… I mean major: cystectomy, bladder recontruction, continent urinary diversion, complex ureteroscopic stone ablation, pyeloplasty hypospadias, urinary fistula and strictures, and stone removal. All the cases seem to get more and more complex and unusual. All the patients are currently doing well and many have left the hospital already, to the surprise of our surgical colleagues here at Dharan. Yesterday, we went to clinic and consulted on some more patients. I thought my clinic was busy. I greatly apologize to my assistant, Ivette, and promise her to never complain about my patient load ever again… or at least for a couple of weeks. Anyway, we have had a great educational opportunity. Every morning we began with lectures for the residents and interns. We hope to have provided them with some better understanding about the current urological diagnosis and management. The residents and interns sent some very nice emails and letters about how much they enjoyed working with us. We feel the same way. I could not have been more fortunate to have such a great team. We all pooled together and worked our behinds off. I thank every one of them for giving 150% effort all day long. To correct Rich, it was not a mouse that scared Jean and Barbara, it was a mole. He came back this morning and visited Norma and Claire and scared the heck out of both of them. I greatly admire each and every one of my team members for their spirits and generous hearts. John, Rich, Norma, Jean, Barbara and Claire are people who truly make the world they live in a much better place. Please do me a favor and let these guys know when they are home what an amazing thing they have done and remind them how great they are every day. We will be starting our journey back home. We all miss our families and friends very much and hope to bring you all back some wonderful souvenirs from this beautiful country. Today was our final day in Dharan. Our morning was spent giving a few lectures on tissue engineering research, stomal care and stone management. 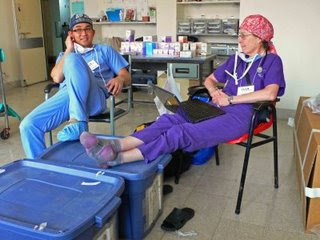 We then completed packing our supplies, visiting our surgical patients, and participating in a farewell ceremony. Over the last few days, our hosts have been giving us an astonishing assortment of foods throughout the day. The quantity of food is definitely much more than we are used to back home, but is commonplace for special occasions and honored guests. These are pictures from our Thursday dinner taken at the Dharan Kitchen restaurant. Take a look at those tikkas that the ladies on our team were wearing. 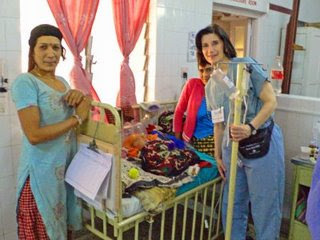 The Nepali nurses were awesome to work with and extremely gracious. When interacting with them, they are called “sister” as a sign of respect. On Friday morning, we met with the OT nurses outside the OT suites and they performed a traditional ceremony to thank the IVUmed team for coming to Dharan and for all of our hard work. Everyone received a red dye mark on the forehead and a scarf. 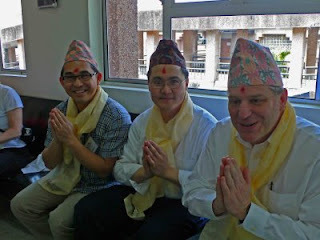 The men were given some cool Nepali hats! Well, it’s getting late and I’m completely exhausted from a week of challenging cases and the workload. Tomorrow, we’re working our way back home via Kathmandu. Bob has planned out the next few days and it sounds like it’s going to be magnificent. I’ll keep you posted! We are so pleased with the receptive audience for our teaching efforts! About 30 nurses from the O.T. attended our talks on Practical Application of Sterile Technique (Norma) and Caring for the Patient with a Mitrofanoff (Barbara and Jean). It was great seeing the nurses in the O.T. that day attempting to gown and glove just like Norma had demonstrated. Now getting the Nepalese surgeons to adopt this new method is something else! We applaud our colleagues for trying. We have done Mits on two adult patients and the ward staff was anxious to learn more about the care and patient education. Yesterday, Jean and I had a great session with the residents (about 15) and ward nurses (8) and then went to the patients’ bedside for further instruction with the patients. Those low-tech flip charts are working out just great for this type of teaching! We are scheduled for another nursing in-service today so we will let you know how that turns out. We have a great team– meeting challenges and being innovative as we go. Such as fashioning a ileostomy bag from a empty IV bag secured with lots of mastisol and tegaderm! My WOC nursing colleagues will love this photo! As well as using the finger of a sterile glove for a penrose drain! Gotta love it! Barbara is tending to the little ones with her Southern charm. This photo was taken in the registrar’s office. So here I am blogging at 3:30 in the morning. It’s the best time to avoid the slow internet traffic using dial-up. Last night, we decided to forgo the normal dinner that is provided at our “guest house.” Some of our team members discovered a cafe about 10 minutes away in the Nirvana country club. I think that we just needed to get away from the monotony of what we’ve been having for dinner since we arrived. Things are going great with the OT and our patients are hanging in there. Yesterday, we found out that somehow our presence at the medical center was released to the local news. So, many people in the region know that we’re here. Sanjeev, a 2nd year surgery resident who has been extremely helpful in answering our questions, mentioned that he spoke with a woman who brought her child a distance of 600km to consult with us on a congenital renal issue. That just amazes me considering how difficult it is to travel here, especially if money is an issue. Oh yes, the latest bandh is over, which means that the roads are also open. Woo hoo! This means that we might be able to go explore the hill country and sightsee on Friday. This also means that patients will again be able to travel to hospital for medical treatment. Claire – went for an extended personal tour of Dharan and has adventures to tell you about. Barb – just found a mouse that decided to spend the night in her room and was not pleased. Jean – misses her husband immensely. We’ll figure out something awesome for her B-day. Norma – did not have Corona last night at dinner and thinks that her husband should come and visit. John – has his own entourage of groupies composed of student nurses and is loving every moment of that. Bob – is holding in there as team leader, despite our gripes and moans. Although, he played a great joke on the ladies yesterday morning. I didn’t know he could be so mean! Rich – is doing great and probably has said way too much on this blog already. Wow… what a crazy ride. We are finally in Dharan and have operated for two days. An amazing amount of stone disease and cancer.I am so thankful for such an wonderful team. Everyone has been working so hard. There are some interesting politics here that prevent us from seeing all the patients we wanted to see. But nevertheless, we have already done 14 cases (many of them are major cases like nephrectomy, pyelolithotomy and URS). I think we were able to show them several new techniques. They were so impress with how quickly we do things and the size of our incisions. Norma, Jean and Barbara have been the backbone of the group. Getting the OR set up and taking care of the patients post-operatively. They were able to doing some teaching and patient education. There is a nursing school here so there are alot of nursing students anxious to learn the way we do things in the States. Claire is such the diplomat. Based on their culture, the Nepalises have some preconceived notions of what women can and cannot do. But with her charm and tact, she was able to show the anesthesia staff a few things about modern anesthesia. What an awesome surgeon and person Rich is. Not only is he responsible for this blog, he has been doing cases (many of which are adult cases) with a big smile; and nothing seems to make him angry or frustrated. A team always need one such person. Thank goodness for John. There are so many cancer cases here. His expertise is so much needed. They only do 2 cystectomies a year but have a ton of patients with muscle-invasive TCC. He will truly make a difference for these people. Okay, got to start off another day… Stay tune for the futher adventures of the Stream Team Nepal 2009. Let me tell you about bandhs (sp?). They are organized protests that occur regularly in Nepal and usually are held by one of many tribes. Of course, each protest has certain demands which usually include increased representation at the local or national level. However, almost daily we hear some news about these protests because they effectively shut down almost all transportation between major areas in Nepal. I forgot to mention in my earlier blog that we rode in ambulances to this location because only ambulances (medical transports) would be allowed past any road blockades. When asked about the duration of protests in general, the locals always say it’s unpredictable. However, that should not affect our departure. The location that we are staying in is very safe because it is a self-contained city within a city with its own power generator and water purification plant. It has a communal feel to it. Honestly, it is paradise compared to the poverty that lies outside the walls of the medical center. Well, in terms of the medical update, we are planning our remaining cases for the next few days and will perform surgical cases up to Thursday. Friday will be for sightseeing and Saturday we will be headed back to Kathmandu. So far, we have worked primarily on adult urology cases, which was quite unexpected and somewhat frustrating for most of our team members. Nevertheless, everyone is holding up well and just focusing on helping out as best as we can. All my best to everyone out there and I’ll blog with you again with more incriminating photos. It is always interesting to share information with the host nurses during IVUmed visits. Oops, short delay the power just went out! We are back in business with Rich’s hand cranked LED light (you can tell he lived in Houston and is hurricane-ready)! Jean has also retrieved her head light! Today we met several nursing students in the OT (operating theatre). All spoke Engligh allowing us to have a good conversation. They are so excited we are here and eager to share information about our nursing professions. After high school graduation (10 grades) nursing students take two years of basic science courses and then 4 years of nursing education leading to a BSN. Upon graduation they are qualified to be educators, researchers and administrators. Nurses work 8-hour rotating shifts. No one like nights! Tomorrow we will be presenting principles of sterile technique to the operating staff and later in the week presenting various topics on pediatric urology. All of the nursing staff are very helpful and good at their jobs! More later we are in the middle of a thunderstorm! Hello all. We have made it to Dharan, Nepal. The flight was great and quite scenic. We caught a glimpse of the Himalayas through the haze. Our host sent a 2nd year surgery resident to meet us at the airport in Biratnagar. We then climbed into two hospital ambulances and headed off to the BP Koirala Medical Center in Dharan. Yesterday evening, we met a number of patients and selected some for surgery on Sunday and Monday. We operated this morning on several cases: re-staging TURBT for bladder cancer, EUA for advanced bladder cancer, posterior urethral valves, and open pyelolithotomy for a large kidney stone. Everyone on the team is doing well and we are trying to settle in. Well, we’ve arrived in Kathmandu. Sorry I didn’t have a chance to update the blog sooner. We arrived in Bangkok early this morning – around 2 am – and slept overnight at the airport hotel. The flight to Kathmandu was smooth, but the troubles began at the airport in Kathmandu. Immigration control is absolutely abysmal. Bob and John were really getting worked up about our 2 1/2 hour wait for a sticker followed by a signature. Then, three of us piled into a tiny van with the baggage to get to the domestic terminal. The others walked… Check-in was nice and chaotic. We waited some more, watched a couple guys have it out with each other, and later found out that our flight to Biratnagar was cancelled due to “issues with the runway at the airport”?? ?